This picture was sent to us by a reader who saw it pop up on his Facebook feed. 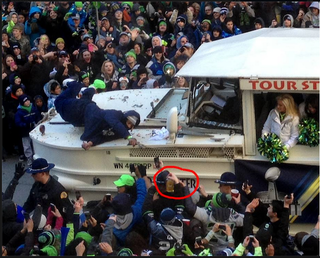 According to the description added by the person who took the picture, that is Marshawn Lynch reaching for a bottle of Fireball while riding on the front of the duck boat during his team's Super Bowl parade. I took this picture as the parade was rolling by our office... This is Marshawn Lynch riding on the front of a duck boat. A man is reaching to hand him a bottle of Fireball (circled). A second later Marshawn grabbed it. Marshawn Lynch is the best.